This pie was good, no wait, this pie was amazing! A little labor intensive but oh so worth it! This recipe is a family favorite, and I have made it one time! There are still a few pieces in the refrigerator, but I have already had requests to make it again! Yep, its that good! Mix cornstarch, salt, 1 cup of milk, egg yolks, and vanilla with a wire whisk until smooth. Set mixture aside. Heat 3 cups milk, butter, and milk until scalding (I heated it up on medium until the butter melted), stirring constantly. Add cornstarch mixture to hot milk while stirring with a whisk (I added the cornstarch mixture in a slow steady stream so that the eggs would not cook in the hot milk). Cook until thickened. Remove from heat before boiling. Set in refrigerator and chill well (I put the pudding in a container with a lid, but due to the fact that it was hot when I put the lid on it, there was a lot of condensation on the pudding when I took it out. It was not really a problem, I just stirred it up before using and it was fine). Mix powdered sugar and peanut butter till small crumbs form (I used my kitchen-aid mixer). Place 1/2 of the crumb mixture into the pie shell. Spoon chilled pudding mix on top of crumbs. Place remaining crumbs on top of pudding, reserving a little to sprinkle on top (I forgot to do that). Top with whipped topping. 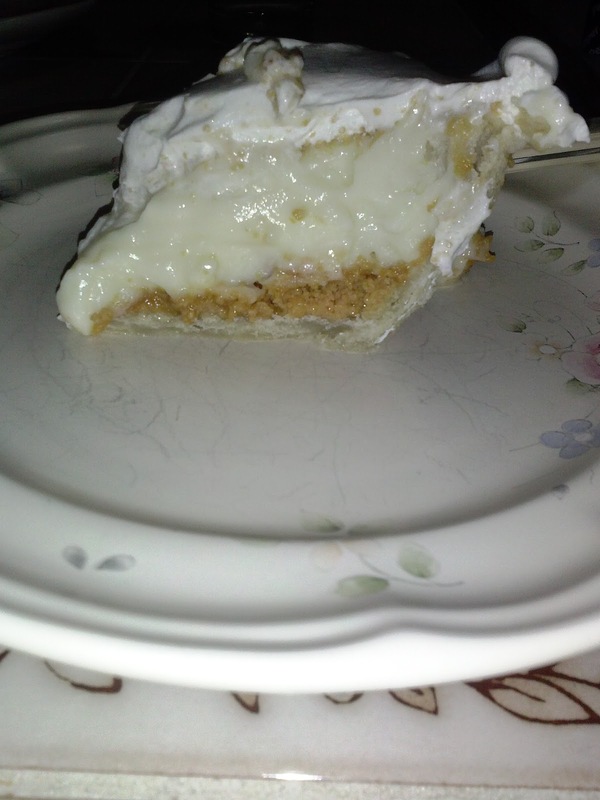 If you do make this pie (and I suggest that you absolutely make this pie) let me know what you thought of it and if you did anything different. The pudding is really good and well worth the effort (in my opinion) but I believe the instant pudding would work too. If you do try it please let me know how it turns out. The star of this pie really is the peanut butter crumbles so I do believe that it would still taste great.